British engineers have unveiled a car seat that cocoons a baby in a protective shell in the event of an accident. The rear-facing Carkoon is also fireproof, providing the child with up to 20 minutes of air and insulating it from a blaze. And for easy release in an accident - or during an everyday trip to the supermarket or nursery - the seat can be swivelled round to face the door, so the child can be easily unbuckled and lifted out. The Carkoon could be on sale as early as next year but, at around 499 pounds, will be considerably more expensive than a standard child seat. 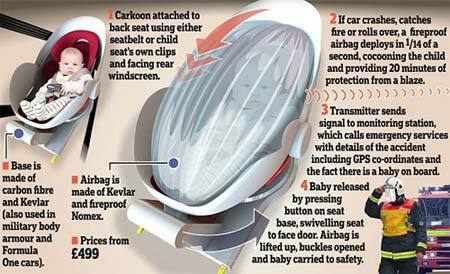 Its main feature is an airbag that folds out on impact, enveloping the child in the seat. The youngster is protected from head to toe but has plenty of breathing space. Unlike traditional airbags that cushion passengers by deflating when hit, the Carkoon's airbag stays inflated and rigid enough to withstand bombardment by any objects dislodged by the crash. Inventor Jullian Preston-Powers said this is vital, as a stray water bottle or satnav can kill in a 30mph crash. We have even bounced a brick off it," the Daily Mail quoted Preston-Powers as saying. He came up with the idea after speaking to a Sussex fireman whose hands were badly burned when he tried to rescue a baby from a burning car. Sadly, the fireman was unsuccessful and the baby died. As well as the swivelling base and airbag, some Carkoon models will have a device that transmit a signal to the emergency services, letting them know there has been an accident with a baby involved. In Britain, car seats for babies usually face backwards while those for toddlers face forwards.